史晓丽, 张莹雪, 孟宪红, 孔杰, 栾生, 罗坤, 曹宝祥, 曹家旺, 陈宝龙. 中国对虾甘氨酸脱羧酶的基因克隆、表达及其与抗WSSV的关联分析[J]. 渔业科学进展, 2019, 40(2): 74-82. DOI: 10.19663/j.issn2095-9869.20171219002. SHI Xiaoli, ZHANG Yingxue, MENG Xianhong, KONG Jie, LUAN Sheng, LUO Kun, CAO Baoxiang, CAO Jiawang, CHEN Baolong. cDNA Cloning of the GLDC Gene in Fenneropenaeus chinensis and Its Expression and Functional Analyses after WSSV Infection[J]. Progress in Fishery Sciences, 2019, 40(2): 74-82. DOI: 10.19663/j.issn2095-9869.20171219002. Corresponding author: MENG Xianhong, E-mail:mengxianhong@ysfri.ac.cn. Abstract: Glycine decarboxylase is a key glycolytic enzyme that is involved in both the glycolytic and gluconeogenic pathways. In this study, the glycine decarboxylase gene from the Chinese shrimp Fenneropenaeus chinensis (FcGLDC) was cloned and sequenced for the first time. 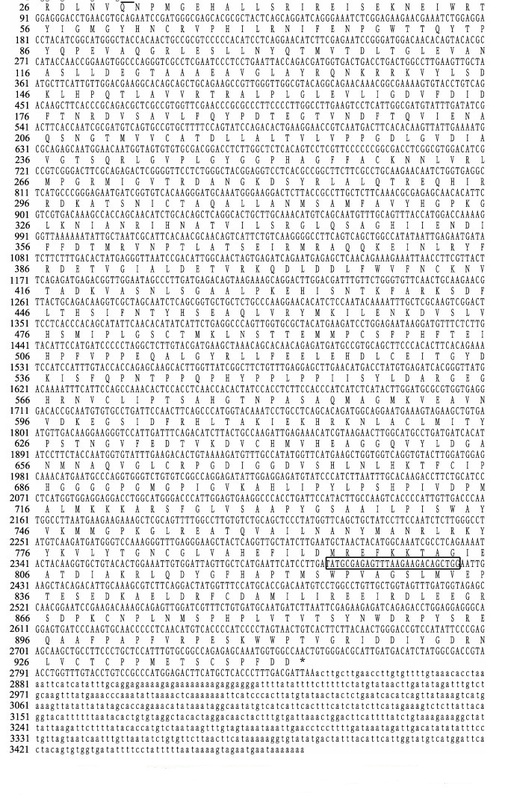 The full-length cDNA sequence of FcGLDC was 3481 bp long and contained a 17 bp 5'-UTR, an 86 bp 3'-UTR, and a 2829-bp open reading frame that encoded a 942 amino acid peptide with a calculated molecular mass of 104.66 kDa and theoretical isoelectric point of 6.51. 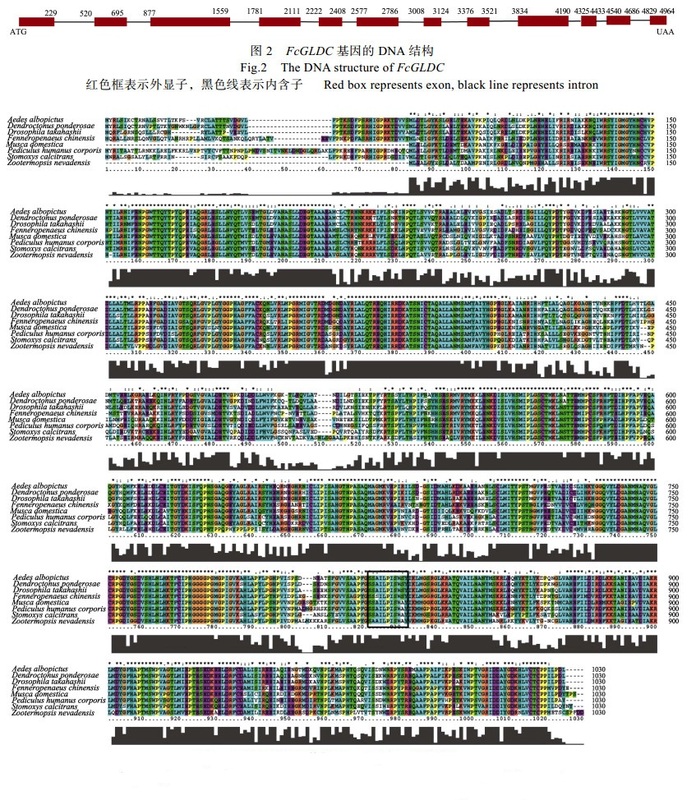 The full-length FcGLDC DNA sequence was 4964 bp long and contained 12 exons and 11 introns. Multiple sequence alignment showed its high similarity with the glycine decarboxylase genes from other arthropod species: Zootermopsis nevadensis (71%), Pediculus humanus corporis (68%), and Aedes albopictus (68%). Phylogenetic analysis revealed that FcGLDC was in the same class with those from the other arthropods. The FcGLDC transcript showed the highest expression in muscles and the lowest expression in the gill. Stimulation of the shrimp with white spot syndrome virus (WSSV) resulted in changes in FcGLDC expression profiles in the hepatopancreas, gill, and muscles. In the gill, the transcript level was approximately 4.47-fold higher than that of the control group (P < 0.05) at 24 h post injection (hpi). In the hepatopancreas, no significant difference was observed between the WSSV-challenged group and the control group (P > 0.05). In the muscles, the transcript levels increased significantly, by approximately 19.98-fold at 24 hpi and 4.21-fold at 72 hpi, relative to the control group levels (P < 0.05). Four single nucleotide polymorphisms were identified, using direct sequencing and time-of-flight mass spectrometry. Association analysis indicated that there was no significant association between the genotype and WSSV resistance (P > 0.05). These results show that FcGLDC is inducible and may be involved in the shrimp's immune response to pathogens.